������ Udon Thani, a northeastern province covering an area of 11,730 square kilometers, is a prime business center of I-San. 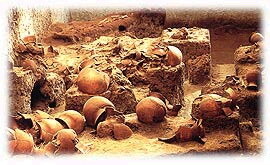 Located 564 kilometers from Bangkok, it the world heritage site for the prehistoric culture of Ban Chiang. Udon Thani's provincial seal depicts God Wetsuwan, King of the giants and keeper of the Northern Heavenly Gate. Buses for Udon leave Bangkok's Northern Bus Terminal (Mochit 2 Bus Terminal) throughout the day from 5 a.m. to 11 p.m. The journey takes around 10 to 11 hours and the fare is 145 baht for regular buses (260 baht for air-conditioned buses). Contact Transport Co. Ltd at Tel: 0-2936-2852-66 or visit www.transport.co.th for more information. Traveling to Ban Chiang National Museum is very easy. It is only fifty-six kilometers from Muang District. The route runs along Highway 22 and turns left onto Highway 2225 at kilometer 50, where a road sign indicates the way to Ban Chiang which is six kilometers away. The museum is open to the general public every day, except Mondays and Tuesdays, from 9 a.m. to 4 p.m.
with an admission fee of 150 baht. The museum has a parking area with toilets and village shops located nearby. This temple is located on Naresuan Road, Tambon Mak Khaeng, off the main road into Soi San Chao Mae Thapthim and opposite to a polytechnic school. It is another forest temple in the area of Amphoe Mueang and has a pleasant shady atmosphere. There is a large pagoda which contains Lord Buddha’s relics. The pagoda is shaped like “Thanan,” a utensil used in ancient times to scoop Lord Buddha’s relics. A portrait of Luang Pu Thira Chitthammo, the present abbot, is displayed with basic living utensils for Buddhist monks in the pavilion. On the fourteenth waxing moon day of the twelfth lunar month, Thot Kathin (robe offering ceremony) and merit making to celebrate the abbot’s birthday anniversary are held every year. Wat Phothisomphon This temple is located on Pho Si Road in Tambon Mak Khaeng. It was built in the late reign of King Rama V. Maha Ammat Tri Phraya Sisuriyaratchawaranuwat (Phothi Netiphothi), Lord Lieutenant of the Udon Circle persuaded the villagers of Mak Khaeng to build the temple, which was commonly called “Wat Mai.” Later, Phra Chao Worawongthoe Krommaluang Chinnawonsiriwat, the Supreme Patriarch, Wat Ratchabophitsathitmahasimaram, named the temple as “Wat Phothisomphon,” to commemorate Phraya Sisuriyaratchawaranuwat, the temple builder. Inside, there is also a museum of revered monks famous for meditation. This temple is located in Tambon Mak Khaeng. During the reign of King Rama V, Krommaluang Prachaksinlapakhom commanded the construction of a new temple to replace Wat Non Mak Khaeng, the old deserted temple, and named it “Wat Matchimawat.” Within its Wihan building, there is a white stone Buddha image under Naga (serpent) protection, or commonly known as “Luangpho Nak,” which has been highly respected by the people of Udon Thani. This temple is located off of the center of the province. Take Highway No. 2 (Udon Thani-Khon Kaen) and make a right turn at Ban Kong Keng and proceed for 9 kilometers. The temple is teeming with trees and small, wild animals. It is here that one of Thailand's most revered monks, Luangta Maha Bua, resides. As the place is set in a tranquil ambience conducive for practicing meditation, a numbers of Thais practice insight meditation (Vipassana) at this temple. Udon Thani Museum Located on Pho Si Road in Rachinuthit Building, this museum was initiated by Mr. Chaiporn Ratananaka, governor of Udon Thani province. It displays background aspects of Udon Thani, ranging from history, archaeology, natural science, geology, folk history, arts and culture, to the biography and honorable deeds of Krommaluang Prachaksinlapakhom, the founder of Udon Thani town. Opening hours are from 08.30 – 16.30 hrs. Admission fees: 10 Baht for adults and 5 Baht for children. This large and beautiful Chinese spirit shrine is located on Nittayo Road behind the train station near Nong Bua Market. Here, there is a small garden beside a lotus pond. Two Chinese pavilions stand in the pond, serving as a view point in pleasant and shady surroundings. The golden dragon of 99 m long, to be used during the Thung Si Mueang annual fair in December, is also kept here. Located in the Udon Thani Municipality, this giant pond has existed before the establishment of Udon Thani town. Lying to the west of the town, it was formerly called “Nong Na Klue” (pond of salty water) and later changed to “Nong Prachak” in honor of Major General HRH Prince Prachaksinlapakhom, the founder of Udon Thani town. In 1987, the Udon Thani Municipality improved the pond as a royal tribute to King Rama IX on the auspicious occasion of his 50th birthday anniversary. On an island in the pond, a small garden is filled with decorative and flowering plants, and there is a bridge linking the island with the mainland. Within the park, there is a fountain, a clock tower, and a playground. It serves as a place of recreation and exercise for the public. The Monument of Krommaluang Prachaksinlapakhom This Monument is located in the heart of Udon Thani city. Born in 1856 as a son of King Rama IV (Phrabat Somdet Phra Chomklaochaoyuhua) and the King’s Consort Sangwan (Chao Chom Manda Sangwan), Major General Prince Prachaksinlapakhom (Phon Tri Phra Chao Borommawongthoe Krommaluang Prachaksinlapakhom), as a regent to King Rama V, ruled the Northern Circle (later called the “Udon Circle”) during 1893 – 1899. As the founder of Udon town in 1893, he set out the civil administration order and served important official duties for the public benefits. The Monument symbolizes the highest tribute paid to the prince by the people of Udon Thani and the ceremony to worship him is held on 18 January every year. Located on the Phu Phan hill, approximately 12 kilometres south of Phu Phra Bat Historical Park. Also discovered and unearthed here at the sight are battlements carved in Dvaravati and Lop Buri arts. Located in Ban Muang, Tambon Wang Thong, approximately 93 kilometres from Udon Thani's town is an area called Wang Nakhin (Naga Palace) a place believed and regarded by the locals as a mystical and holy place where the door to the underworld of Naga is located. Covering an area of over 20 rai of land, Wang Nakhin (locally dubbed as Dong Chanot) is nothing but an islet surrounded by water. It is teemed with dense palm trees called Chanot. Traveling to the place is easy by Udon Thani Sakon Nakhon route. At Ban Nong Mek, turn left and proceed approximately 84 kilometres to Ban Dung, and another 9 kilometres to Ban Kham Chanot. เวลาเปิด-ปิด : พิพิธภัณฑ์ฯเปิดให้เข้าชมทุกวัน เวลา 08.30-16.30 น. เวลาเปิด-ปิด : อุทยานประวัติศาสตร์ภูพระบาทเปิดบริการทุกวัน เวลา 08.00-16.30 น.